I don't believe he does in the book, but he does in the movie. This line just made me very happy. In the movie, there are several points where Gimli is treated as comic relief, and this is one of those. I'll leave aside any movie rants, but I do wish that the LEGO designers wouldn't go out of their way to design sets around Peter Jackson's departures from the text. There are so many amazing sets they could potentially build that would fit perfectly with both the books and the movies. The picture from earlier in the thread of the 79006 The Council of Elrond is a bit misleading. When you look at the actual pictures of the set the arch pieces seem to be in white and the leaves seem to be in dark red. Just in case anyone had their hopes up. The new castle sets are a big disappointment. However there is something familiar about them. Hmmmm... they look a lot like remakes of the Duplo castle sets that were out a few years ago. I don't have time to post the pics myself, but check out the duplo set #'s 4776, 4862, 4863 and 4864. How unoriginal can you get! Dear LEGO: When we asked for remakes of classic castle sets, that's not what we meant. Last edited by Sir Osis of Liver on Mon Feb 11, 2013 4:39 pm, edited 1 time in total. I don't see where you're getting dark red. I'm looking at photos from Project Azazel, FBTB, Joe Meno and the official box art, and it seems clear that the leaves are in dark orange. This is with different cameras, from different angles, with different lighting (note that Joe's photos seem to be from Nuremberg while the others are from New York), so it's not just a trick of the shadows. Yes, on your other note, the gothic arch piece definitely seems to be in white, as you can see it right next to tan elements. I am not a huge fan so far of the pics I have seen of the new castle sets. Lego has all these new fantastic parts out now that they could have used to build amazing sets, but the castle just looks like a panel/plate fest. Don't get me wrong, I am sure I will buy everyone of them, it just looks that the line wasn't well thought out. As far as figs, I think the Lion knights, look fantastic. The dragon knights however look really lackluster. Both kingdoms factions and the crownies were factions that you could build great looking armies from imo, and the design of these dragon knights looks more comical than anything. I might think differently once I see them in person, but that is my first impression. I will say that the Red horse barding head armor does look pretty sweet. Bruce N H wrote: I don't see where you're getting dark red. I'm looking at photos from Project Azazel, FBTB, Joe Meno and the official box art, and it seems clear that the leaves are in dark orange. This is with different cameras, from different angles, with different lighting (note that Joe's photos seem to be from Nuremberg while the others are from New York), so it's not just a trick of the shadows. Yes, on your other note, the gothic arch piece definitely seems to be in white, as you can see it right next to tan elements. I stand corrected on the dark red. Looks like dark orange now that I've compared it to another photo gallery that you linked. Sweet! bring on the new leaf color~! Bruce N H wrote: ...I do wish that the LEGO designers wouldn't go out of their way to design sets around Peter Jackson's departures from the text. You do realize that they are building sets based on the movies alone. Any similarity to, or material from, the books is accidental - or possibly "accidental. I do like to chime in when new sets are announced. The new Castle line feels familiar, and not in the best of ways, but as with nearly any Castle-theme set, I can see things I'd like to have in addition to the whole lot of extraneous bits. 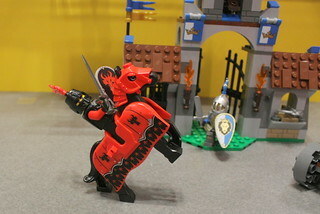 New Minifigs and heraldry, I'd like to get my hands on. Yes, it's another Lion/Crown combination and another Dragon, but since my personal world has always used all Lions & Crowns as part and parcel of the same heraldic dynasty, just different houses (ditto, Dragons) it's just a new Lord & Lady and a new Knight and a new House Guard. I already have an identical dragon, only green. The castle is nice but lacks an aesthetic novelty. I do like the octagonal towers. The gatehouse is very inferior to previous gatehouse or drawbridge sets, but has a nice selection of figures and elements. The forest ambush is a sweet builder, probably the best bet for sure. The chariot, I may get. I have a thing for well-designed chariots. As for The Hobbit and Lord of the Rings sets, as insane a LEGO and Lord of the Rings fan as I am, I'm fairly ambivalent to the whole idea. The white wizard hair & beard piece is pretty nice. And the Eye of Sauron (is that a minifig head piece?) could make for an interesting bunch of customs. Or better still - two of them would make awesome eyes in a brick-built monster. Just to let everyone know, FBTB's Flickr stream has a whole bunch of nice pictures of both the new Castl and LOTR set - mostly what we've already seen, though there's some new details buried in there - here, for example, is the new Castle wizard, and here's a good shot of the Mouth of Sauron from the Black Gate set (I hope he's got a full face print, and not just a mouth . . . ). Pretty cool stuff coming on the horizon. I kinda wish they beefed up the gatehouse a bit, and the wizard tower, and.... anyway all around it doesn't look that bad. I'm one that prefers the accessories more so I'm content (surprisingly) with most of the stuff. And the new Lone Ranger sets have some pretty sweet new pieces as well. I have to admit that I haven't read every post in this thread, but I just wanted to highlight that these sets have a new barding and helm to fit the new horse mold (available in both the black/red dragon livery and the blue/white crown livery). I'm also very excited by the small Forest Ambush set - two soldiers from each faction, with two shields, five weapons - great army builder. Throw in flags, wheels, chest, some jewels, and a dog as a bonus. Oh, also note that the crossbow in black has only been seen once 12 years ago, so that's cool. One last thing I note is a 1x1 round tile with a printed lock design that shows up in both the Gold Getaway and Dragon Mountain sets. That'll be a nice element. Are you sure Bruce? Compared to the legs on the dragon soldier the crossbow looks like pearl dark grey. And that would kinda make more sense, because it's been made more recently.... could be wrong though. Thanks for these Azaghal! Now while I am still sticking with my previous judgment on the castle line (sucky), the New Lotr sets are really great! Wizards battle is a cheaper way to get two cool wizard figs. Council of Elrond has some great vegetation and architecture parts. My only disappointment with them is the eagle. A single reverse stud leg? Are you serious? I would have like to see two independent pose able legs. Oh well. Bruce N H wrote: One last thing I note is a 1x1 round tile with a printed lock design that shows up in both the Gold Getaway and Dragon Mountain sets. That'll be a nice element. Aeridian wrote: Are you sure Bruce? Compared to the legs on the dragon soldier the crossbow looks like pearl dark grey. And that would kinda make more sense, because it's been made more recently.... could be wrong though. In the LOTR black gate set, one can say what is good with it and what is lacking and what could been better. But Aragorn with out his horse what, how will he now behead the Mouth, tripple jump, swing?